On the heels of the International Coalition for Human Rights in the Philippines (ICHRP US) Stop the Killings Speaking Tour: The People’s Caravan for Peace & Justice in the Philippines, the Senate Appropriations subcommittee on State Foreign operations adopted new language that adds to the international condemnation of human rights violations under President Duterte. 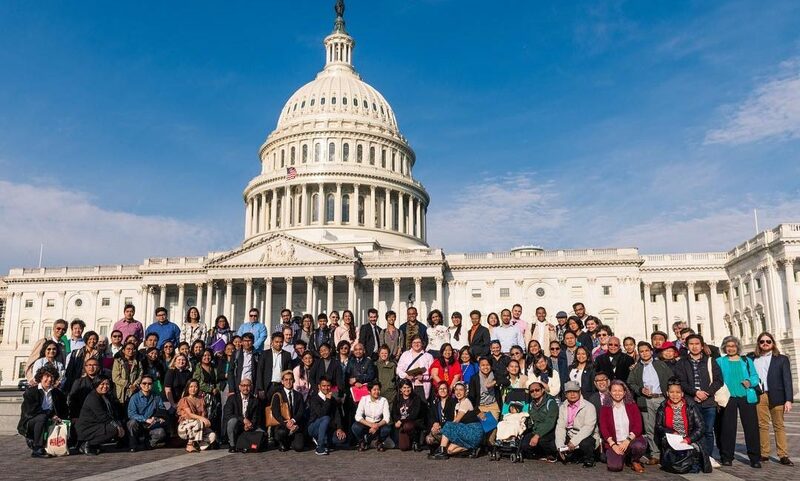 The national speaking tour kicked off in Washington D.C. and included advocacy days led by the Ecumenical Advocacy Network on the Philippines (EANP), which featured testimony from Philippine indigenous human rights defenders in 20 congressional visits. The visits urged members of Congress to restrict aid to the Armed Forces of the Philippines (AFP) and the Philippine National Police. “It is good to see that at least some members of the US Congress are responding to the outcries of Filipinos and their allies in the US about the many serious human rights abuses in the Philippines,” said Paul Bloom, co-coordinator of EANP. A week earlier the House of Representatives Appropriations Committee approved their version of the funding bill. The Committee stated that, “Extrajudicial killings in the Philippines, including those committed in the conduct of the anti-drug campaign, erode confidence in the Government of the Philippines’ commitment to human rights, due process, and the rule of law”. The funding bills prohibit the PNP from using any US aid funds for its program of extrajudicial killings in the war on drugs. The bills require that ” — funds be made available to USAID [Agency for International Development] to continue support for the national and community based drug treatment and demand reduction program implemented by the Philippine Department of Health and local entities”. The bills allocate funding for fiscal year 2019, which begins October 1, 2018. The human rights language in these funding bills comes in the wake of reports of an excess of 20,000 killings in President Duterte’s war on drugs; his recent listing of 600 suspected terrorists that includes human rights defenders and even the UN Special Rapporteur on Indigenous Rights; and, of many recent reports of killings of human rights defenders, indigenous rights leaders, environmental activists, and religious leaders. The network of groups involved in advocacy efforts included EANP, ICHRP, NEFFCON Norcal, the Justice and Witness Ministries of the United Church of Christ, U.S. Filipinos for Good Governance, and StoptheDrugWar.org. Portland, OR– On May 6, 2018 members of the International Coalition for Human Rights in the Philippines – Pacific Northwest Chapter (ICHRP-PNW) gathered to give testimony in front of the Portland City Council, calling the City to support a resolution passed by San Francisco Board of Supervisors in the wake of the torture and deportation of Jerome Aba, a Filipino human rights and peace activist. ICHRP-PNW members further explained the human rights situation in the Philippines under the US-Duterte regime, informing the council about the over 20K extrajudicial killings (EJKs) which have occurred under Duterte’s bloody drug war, and finally calling for the safe passage of all migrants and international travelers through Portland ports. ICHRP-PNW members highlighted the growing partnership between the U.S. and Duterte regime through the detainment, torture, and interrogation of Jerome Aba, who fell subject to the harassment of US Border and Customs Agents in April. Aba held a ten year visa when he arrived at San Francisco International Airport as a part of the Stop the Killings Speaking Tour, and was set to arrive in Portland in May. Mayor Ted Wheeler expressed his support for the ICHRP’s cause, saying, “I will put it on the record, in my opinion, President Duterte is not a credible leader that should be supported by the United States.” In a similarly positive statement, Commissioner Chloe Eudaly simply remarked, “Let’s take action,” referring ICHRP-PNW to address the Portland Human Rights Commission to further their advocacy around human rights abuses in the Philippines. Taking it’s message to the Portland streets, ICHRP-PNW also posted a billboard add that reads: Stop the Killings: End U.S. Military Aid to the Philippines” on the corner of SW 6th Ave. and SW Broadway. ICHRP-PNW, born in December 2017 in Portland, seeks to unite with “any possible” individual and organization for the cause of a just and lasting peace in the Philippines. As human rights violations in the Philippines increases and as the campaign for Justice for Jerome Aba heightens, ICHRP-PNW calls for the broadest possible solidarity for the Filipino People. You can view the full hearing of the City Hall meeting here, between 6 minutes and 25 minutes. From Washington D.C, to New York, New Jersey, Chicago, Seattle, Portland, San Francisco, San Jose, Oakland, Davis, and El Sobrante, the Stop the Killings Speaking Tour: The People’s Caravan for Peace and Justice in the Philippines culminated with a final rally at the Philippine Consulate and celebration in Los Angeles, CA before making a final stop in Hawaii. ​The People’s Caravan, hosted by the International Coalition for Human Rights in the Philippines- U.S. and the Malaya Movement, comes in wake of the growing number of extrajudicial killings reaching 20,000 under the Duterte regime, the recent removal of Philippine Chief Justice Sereno, seen by many as the “death of democracy,” and the start of U.S. military “balikatan” exercises in the Philippines. The tour brought guest speakers from the Philippines to expose the violent and oppressive conditions under the Duterte government. They called upon people in the U.S. to join the Filipino people in demanding an end to U.S. military aid to the Philippines and to stop the killings. It comes as no coincidence that one of the first Tour speaker to land in the U.S., Jerome Aba, a speaker from Mindanao who has been vocal against U.S. intervention in the Philippines, was detained, tortured and deported upon his arrival in the U.S. at San Francisco International Airport (SFO), a move that has been condemned by the San Francisco Board of Supervisors. Indeed, despite the deportation of Aba, three resource speakers from the Philippines were able to travel the tour: Mong Palatino, Junance Magbuana of the Save Our Schools Network, and Elder Labog, Chairperson of Kilusang Mayo Uno (May First Movement). Magbuana spoke of the heightened struggle under President Rodrigo Duterte’s growing dictatorship and intense militarization of Mindanao. “The world is becoming more and more dangerous for human rights defenders,” she said. “With martial law, government forces were given authority for extrajudicial killings. Fear and death is what we have in Mindanao, not peace and justice under martial law.” Under the Duterte regime, more than 20,000 people have been killed under the President’s war on drugs and martial law. President Trump has shown support and admiration for Duterte and his war on drugs, saying that Duterte is “doing a good job,” and suggesting the U.S should implement something similar. Over the course of the Speaking Tour, from Washington D.C. to Los Angeles, ICHRP-US and the Malaya Movement held 28 forums, 20 congressional visits, and ten mobilizations reaching thousands of people. On May 1st in Chicago at Haymarket Square, where International Workers Day is commemorated as a site of violence against workers, labor leaders honored the Philippine workers movement with a plaque in honor of Kilusang Mayo Uno, the democratic labor center promoting genuine, militant and anti-imperialist trade unionism in the Philippines. Throughout the tour, Elmer Labog also met with and rekindled relationships with U.S. labor groups, including the International Longshore Workers Unions (ILWU), the Asian Pacific Labor Alliance (APALA) and the Chicago Teachers Union. Once the tour hit Seattle, speakers and over 20 delegates from over twenty organizations logged 1,500 miles in the people’s caravan. The growing US movement against the killings in the Philippines is still young — ICHRP-US only formally launched in December of 2017, and the Malaya Movement in February of this year. The increasing violent suppression and extra-judicial killings under President Duterte has only helped to grow the movement against him calling for an end to U.S. military aid to the Philippines. If the persistence of the tour in wake of Aba’s deportment and the thousands who mobilized in support are any sign — it’s a movement that only sees growth and victories in its future. Los Angeles, CA – On May 11th, the International Coalition for Human Rights in the Philippines (ICHRP – US) and the Malaya Movement culminated the Stop the Killings Speaking Tour: The People’s Caravan for Peace and Justice in the Philippines with a 100-person rally in front of the Philippine Consulate in Los Angeles, home to the largest number of Filipinos in the country. Among the 100 people, a blue bus with the word “MALAYA” (meaning “free” in Tagalog) written on its windows was parked in front of the Philippine Consulate and had just traveled down the west coast to transport human rights speakers from Philippines and advocates from Seattle, Portland, and San Francisco to join the Los Angeles community in condemning the mass killings of Filipinos by President Rodrigo Duterte. The rally featured speakers of human rights experts, survivors of human rights violations, and faith leaders; street theatre and musical performances; and the delivery of a community-signed letter to the Philippine Consulate to garner their support in helping end the killings under Duterte’s drug war. Since the Government of the Philippines’ cancellation of peace talks with the National Democratic Front amidst a 50 year civil war, a rising dictatorship has emerged under the administration of Rodrigo Duterte. On Friday of last week, Duterte consolidated power over the judiciary, legislative, and executive branches and removed his Chief Justice Maria Lourdes Sereno. This follows last year’s declaration and extension of Martial Law in Mindanao despite widespread protests. “Why does Duterte want to centralize power? To evade accountability for the repressive three wars of his government – his war against drugs, war on terror, and all-out war against human rights activists. All of these wars should really be called the war against the poor, or war against people. Why does he continue to extend and extend martial law? To displace people, especially indigenous people resisting the presence of mining and multinational corporations who are extracting from their ancestral land. Why does he criminalize activists? To justify the termination of the peace process. Instead of addressing roots of armed conflict, he wages these repressive wars against people and ignores legitimate demands by the people to implement genuine land reform, national industrialization, and respect the rights of people”, says Raymond Palatino, a two time former Philippine Congressman who traveled from the Philippines to join the national speaking tour. The rally featured a street theatre performance by members of Anakbayan Los Angeles, a progressive youth organization, to commemorate and highlight the lives of victims killed by Philippine National Police (PNP), Armed Forces of the Philippines (AFP), and paramilitary troops. Many victims highlighted were members of peasant or indigenous organizations working towards genuine democracy in Philippines. Attendees of the rally signed a poster-sized letter that was hand-delivered to the Philippine Consulate by Trinidad and her fellow Malaya co-convenors Father Toting of St. Matthew Church and Terry Valen, the President of the National Alliance for Filipino Concerns. The letter featured the names and faces of the extra-judicial killings under Duterte and read: “20,000+ Filipinos have been killed under President Duterte’s war on the poor, the Moro, and human rights defenders. We urge you to #StopTheKillingsPH”. Photo: Rally attendees signing a poster-sized letter condemning the 20,000 lives killed under the Duterte regime that was later delivered to the Philippine Consulate. While the crisis in the Philippines has worsened, the U.S. has expanded support for the increasingly fascist regime. Trump has expressed admiration for Duterte and the drug war in the Philippines, and has promised more military aid while secretly beginning a new military endeavor, Operation Pacific Eagle, which creates provisions for endless spending similar to what occurred in Iraq and Afghanistan in the war on terror. In recent weeks, the U.S. provided $13.5 million dollars worth of surveillance drones to the Philippine military that continues to commit crimes against human rights defenders. “We urge U.S. authorities to withdraw U.S. military aid to the Philippines. Withdraw the drones deployed by the U.S. Army, and stop supporting the repressive and deadly regime of Duterte. Filipinos will continue to defend our democracy, human rights, and quest for real freedom, justice, and peace”, says Palatino. The tour started in Washington D.C. with Ecumenical Advocacy Days and moved on to New York and Chicago before traveling down the west coast to Seattle, Portland, San Francisco, and Los Angeles by bus. The tour is scheduled to continue on to Hawaii next month. Across these tour stops, the speakers joined meetings with congressional offices and community events to educate the public on the human rights crisis in Philippines. After the rally, Malaya Movement hosted a mixer and cultural night at Precious Blood Catholic Church wherein 150 people attended to learn more about the human rights situation in Philippines and how to build a movement to stop the killings. The mixer event had co-emcees, Filipino talk show host and producer, Giselle “G” Tongi and Roger Rigor, singer of the popular Manila disco group VST & Co. Investigate the CBP! Justice for Jerome Aba! The US Chapter of the International Coalition for Human Rights in the Philippines (ICHRP-US) supports Jerome Aba’s demand for an investigation into what happened to him at the hands of the Customs and Border Protection (CBP) Agency last April 17-19 at the San Francisco International Airport. Despite Aba’s detailed testimony, the CBP has stated that its agents “treat all travelers with dignity and respect” and not admitted any mistreatment of Aba, a 25 year old Moro (Muslim) peace advocate from Mindanao who was granted a 10 year multiple entry visa to the US upon the invitation of several US church groups. Aba’s account of his treatment by CBP fits a an escalating pattern of abuse meted out by border agents against travelers and migrants since the declaration of the so-called “War on Terror” in 2001. “The response of the US CBP is an outrageous lie. So many thousands of migrants have told horror stories of the violent attacks, withholding of food and water, intimidation and coercion, and humiliating and misleading interrogation they’ve experienced at the hands of CBP agents. It is well-documented that such abuse has become routine practice for the agency, but we will not stand for the CBP’s ‘business as usual’ behavior. The US government must answer for the CBP and Homeland Security’s inhumane treatment of Jerome, and a full investigation and accountability for the agents’ treatment must be secured,” said Pam Tau Lee, Chair of ICHRP-US. Aba submitted a letter to Philippine Foreign Affairs Secretary Alan Cayetano to formally demand an independent, impartial investigation into his torture, arbitrary detention and other mistreatment and rights violations inflicted on him by US Department of Homeland Security and Customs and Border Protection; hold accountable Philippine Consulate officers in San Francisco, US for their neglect of Aba; and to file a diplomatic protest against the US government on what had happened to him. “Unfortunately, Jerome’s case is one of many. In addition to the rampant abuse of migrants at borders, the Trump administration’s ‘extreme vetting’ program is intended to bar activists, artists and other experts from entering the US to speak out on social and political justice issues. The detention and interrogation of Jerome Aba included repeated questioning about his human rights advocacy. This is an indication that they want to seek out and cause harm to the rightful organizing that has mobilized vast numbers seeking to amplify the voices of those victimized by the culture of impunity in the Philippines and the role of the US in supporting Duterte’s regime. It is my hope that a successful investigation into what happened to Jerome at SFO results in policy changes in how arrivals are treated, including legal representation at the point of entry and also recognition of the UN Declaration of Human Rights,” concluded Lee. FIRST PERSON ACCOUNT: I am Jerome Succor Aba. I am a Muslim human rights worker from Mindanao, NOT a terrorist. ICHRP US members joined Muslim community groups in their rally and call for #NoMuslimBanEver. And Muslim community leaders stood with ICHRP US members to support our call for #Justice4Jerome. ​8 days ago – Jerome Succor Aba became the first Moro, a Filipino Muslim, to fall victim to US President Trump’s Muslim ban. For 28 hours, Jerome was detained at SFO airport by the Customs and Border Patrol, denied access to any outside communication, and suffered brutally inhumane treatment before being sent back to the Philippines. He had been invited to the U.S. by church groups and rights advocates to be a featured speaker in the Ecumenical Advocacy Days and in the national Stop The Killings speaking tour hosted by ICHRP US and Malaya. ​For the past 8 days, the more than 40 member organizations of ICHRP US across the country have been rallying to demand #Justice4Jerome and we will continue to do so from Washington D.C. to SFO to the Philippines. Aba also testified about the coercion he experienced: “[Lopez] He said in order to be released, sign this. It’s a blank paper. Because I was so exhausted, I signed it. I tried to write ‘UP’ to mean ‘under pressure’ but he took the paper, and made me sign another piece of paper. So I did it.” Before Aba was released, the agents also shredded in front of him a foot-tall stack of papers that the agents purported were their profile on him and he was made to record a statement on video that he was not tortured. CBP spokesman Jaime Ruiz also made the statement that “U.S. Customs and Border Protection does not consider country of origin or human rights activism to be determining factors for admissibility.” Meanwhile, Aba was extensively interrogated about his national affiliations, his political beliefs, and his cultural effects and was repeatedly accused of being a “terrorist” and a “communist”. Aba was invited by the General Board of Global Ministries of the United Methodist Church, Sisters of Mercy of the Americas, US Conference of Catholic Bishops, and the International Coalition for Human Rights in the Philippines – US, to speak in the Ecumenical Advocacy Days and a peace caravan in the US this April 19 to May 14. He was given a 10 -year multiple entry visa by the US Embassy in Manila and was scheduled to meet with several congressional offices and human rights organizations. “All of us at at the Ecumenical Advocacy Days were deeply disturbed to hear about Mr. Jerome Aba’s mistreatment and subjection to harsh and degrading measures while detained for over 24 hours without access to a lawyer. That a human rights defender like Jerome Aba would be so harshly mistreated and denied entry only redoubles our conviction to address both urgent human rights crisis in the Philippines and to call for investigation into his treatment by CBP,” said David Wildman, Executive Secretary for Human Rights and Racial Justice of the General Board of Global Ministries of the United Methodist Church. “We are appalled at the inhumane and cruel treatment of Jerome Aba and the physical and psychological abuse he was subjected to including physical threats, intimidation, and coercion.” said Pam Tau Lee, Chairperson of the U.S. chapter of the International Coalition for Human Rights in the Philippines. “Mr. Aba’s rights were violated. He was subjected to blatant racial profiling and anti-Muslim accusations. His legal and human rights were wholly disregarded. It is so reprehensible that Mr. Aba travelled to the U.S. so that he may be a voice for the hundreds of thousands of urban poor, indigenous people and national minorities being victimized under Philippine President Duterte’s brutal drug war, martial law and counter-insurgency war, only to become a human rights victim himself suffering dehumanizing treatment at the hands of Homeland Security agents at SFO.” Continued Lee. “Mr. Aba’s treatment at SFO, in our “sanctuary city” goes against everything we stand for as San Franciscans. We call on our federal representatives and all City officials to condemn these horrendous attacks on human rights in our own backyard,” added Pam Tau Lee who is a long-time San Francisco resident and labor, indigenous and environmental rights activist currently in Washington DC participating in the Ecumenical Advocacy Days.